Forgotten for months after an extended period of downtime did not result in any noticeable improvement, everyone’s favorite video chat site Chatroulette has come up with the following solution to its problem of declining usership: Skins! After following a cryptic tweet from the @Chatroulette Twitter account (“chatroulette is back ! 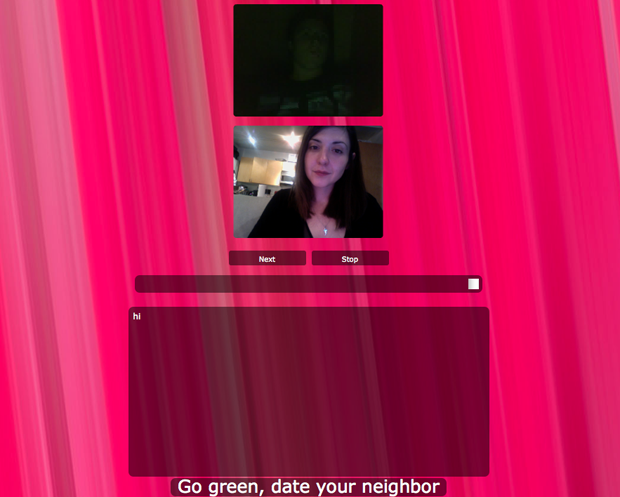 a new face chatroulette.com”) down a rabbit hole, I discovered that you can now change your background on Chatroulette while you chat. In my brief foray, I’ve seen everything from Greek mythology-theme to rainbow hyper-color to sunburst to paisley to the hot pink we’ve got going on above. Unfortunately the video part of the chat doesn’t seem to work for me on my own computer at the moment, and I had to switch computers to get the above screencap. On about my fifth try, I got asked to take a user survey which may or may not have won a me a free iPad. There is also strange, “Go green, date your neighbor” link at the bottom of the site which leads to Singles-roulette.com. I didn’t venture any further. I’ve emailed Chatroulette founder Andrey Ternovskiy to see if he has plans for anything more than an interface refresh and Trapper Keeper-inspired graphics in order combat lagging site traffic and will update this post if/when he gets back to me. On a more positive note, I’ve yet to see anything NSFW. Maybe the skins are working after all? Update: It gets curiouser and curiouser. Ternovskiy just emailed to inform me that @Chatroulette is not an official Twitter account, and despite what Google trends is showing, site traffic has been up since October. The Skinsroulette feature, which the company did not intend to announce, was put into effect a couple days ago. 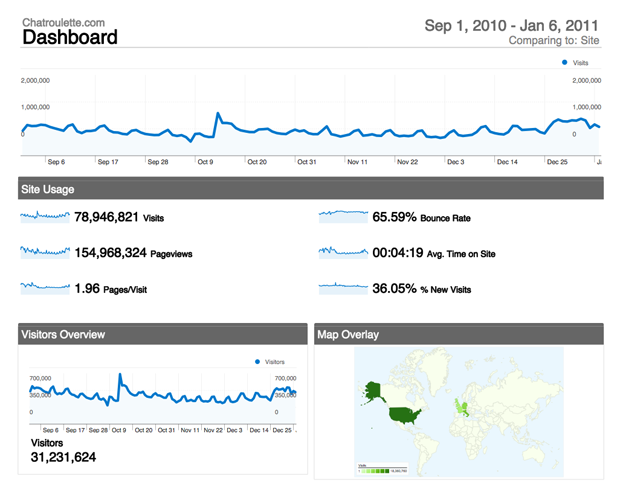 Here’s what his own internal Google Analytics dashboard shows, below.